The theme for the latest Phat Quarter swap was music, which is probably the best and most troubling theme ever since there are so many different ways you can go. Because of that, I used half of my 3 week stitch time just deciding what to do. Then it took me another 3-4 days to create the pattern, leaving me with less than a week to get the piece stitched and in the mail. It took long days of stitching to get it done but it gave me some purpose for a week, which is something you definitely lose when unemployed, so that was nice. 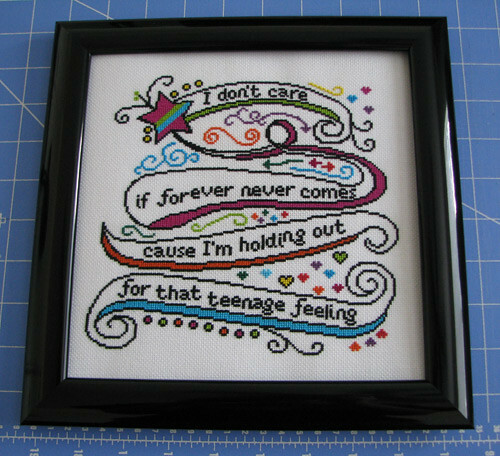 The lyric is from the Neko Case song, "That Teenage Feeling". The idea was to create something that looks like a teenage girl's doodles, using bright colors (my partner's favorites) and random doodle-y elements. When I doodle, I always draw arrows for some reason, so I included those. I drew the original design by hand, then converted it into an Illustrator image (using my lousy Illustrator skills) and then imported into PC Stitch. That's why it took so long to make the pattern. Overall, I'm happy with the way it turned out. I also got out of my 5x5 frame rut. This one's in an 8x8! Wow, that piece is amazing. I'd sure stitch that and hang it on my wall.